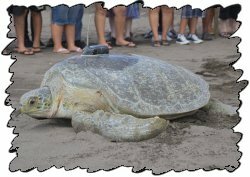 In 2000 the Sea Turtle Conservancy (STC) began satellite tagging sea turtles to study their migration from their nesting grounds at Tortuguero, Costa Rica to their feeding grounds throughout the wider Caribbean. 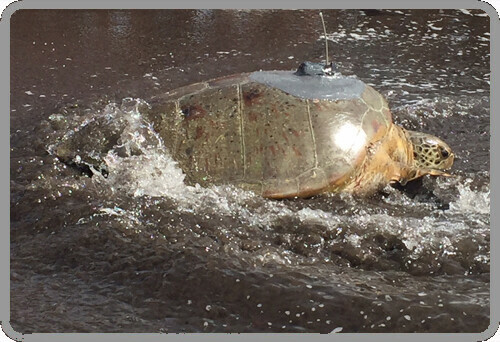 A satellite transmitter was attached to the shell of the sea turtle and using this state-of-the-art satellite-tracking technology, STC and other researchers are able to monitor the movements of sea turtles once back in the water. 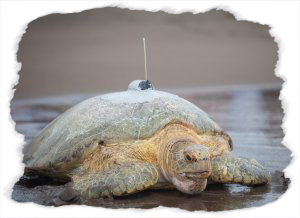 Both green and hawksbill sea turtles are being tracked as part of this study designed to help STC and others learn more about the migratory behavior of these species. This information will help both conservationists and natural resource managers improve protection efforts for this endangered species by helping establish “migration pathways” between nesting grounds and feeding areas. Through STC’s Sea Turtle Migration-Tracking Education Program, the public is invited to watch along on the Internet as we learn more about these amazing animals. BEAN – Bean is an adult female green sea turtle released with a satellite transmitter on August 5, 2018 from Tortuguero National Park in Costa Rica. She measured 114.6 cm in curved carapace (shell) length and was named by Sea Turtle Conservancy’s Tortuguero Research Assistants. CORDELIA – Cordelia is an adult female green sea turtle released with a satellite transmitter on August 5, 2018 from Tortuguero National Park in Costa Rica. She measured 110.0 cm in curved carapace (shell) length and is sponsored by Greene Turtle Sports Bar & Grill. 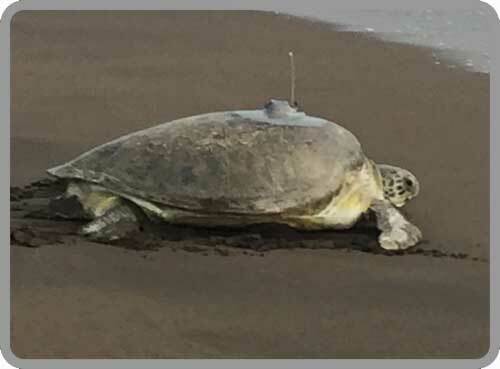 VIDA – Vida is an adult female green sea turtle released with a satellite transmitter on August 6, 2018 from Tortuguero National Park in Costa Rica. She measured 115.0 cm in curved carapace (shell) length and was named by her sponsor, Pura Vida Bracelets. ANGEL – Angel is an adult female green sea turtle released with a satellite transmitter from Tortuguero National Park in Costa Rica. She measured 102.8 cm in straight carapace (shell) length, and 109.0 cm in curved carapace length. She was named by her sponsor, DivinityLA. REEFIE – Reefie is an adult female green sea turtle released with a satellite transmitter on August 7,2017 from Tortuguero National Park in Costa Rica. She measured 109.0 cm in straight carapace (shell) length. She was named by her sponsor, The Greene Turtle Sports Bar & Grille. SANCHEZ – Sanchez is an adult female green sea turtle released with a satellite transmitter on August 7, 2017 from Tortuguero National Park in Costa Rica. She measured 108.0 cm in straight carapace (shell) length and was named by her sponsor, World Nomads. TARTLE – Tartle is an adult female green sea turtle released with a satellite transmitter on August 7,2017 from Tortuguero National Park in Costa Rica. She measured 112.0 cm in straight carapace (shell) length. She was named by her sponsor, tarte, and took part in the 2017 Tour de Turtles. EMMA – Emma is an adult female green sea turtle released on July 10, 2016 with a satellite transmitter after nesting in on Tortuguero Beach, Costa Rica. She measured 106.6 cm in curved carapace (shell) length and 99.5 cm in straight carapace length. Emma laid 68 eggs in her nest and she was originally flipper tagged in 2013. PEBBLES – Pebbles is an adult female green sea turtle released on July 9, 2016 with a satellite transmitter after nesting in on Tortuguero Beach, Costa Rica. She measured 109.4 cm in curved carapace (shell) length. She is taking part in the 2016 Tour de Turtles and was named by sponsor, DivinityLA. PAWIKAN – Pawikan is an adult female green sea turtle released on July 1, 2015 with a satellite transmitter after nesting in section 3 6/8 on Tortuguero Beach, Costa Rica. She measured 107.5 cm curved carapace length. Pawikan is taking part in the 2015 Tour de Turtles and was named by her sponsor, Pacsafe. TIKI – Tiki is an adult female hawksbill sea turtle released on July 2, 2015 with a satellite transmitter after nesting on Tortuguero Beach, Costa Rica. She measured 90.9 cm curved carapace length. Tiki is taking part in the 2015 Tour de Turtles and was named by her sponsor, Contiki and TreadRight Foundation. SUSIE Q – Susie Q is an adult female green sea turtle released on July 2, 2015 with a satellite transmitter after nesting on Tortuguero Beach, Costa Rica. 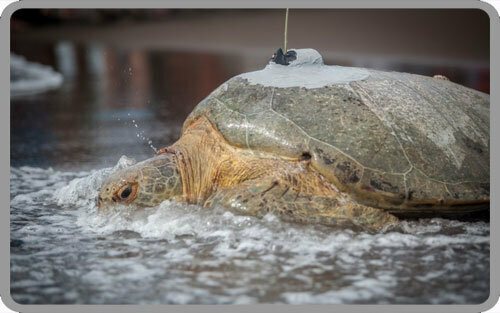 Susie Q is taking part in the 2015 Tour de Turtles and was named by her sponsor, Turtle & Hughes, Inc.
ESPERANZA – Esperanza is an adult female green sea turtle released with a satellite transmitter on July 3, 2014 from Tortuguero National Park in Costa Rica. She measured 104.9 cm in curved carapace (shell) length. She is taking part in the 2014 Tour de Turtles and was named by her sponsors, Contiki and TreadRight Foundation. ESTRELLA – Estrella is an adult female hawksbill sea turtle released with a satellite transmitter on July 4, 2014 from Tortuguero National Park in Costa Rica. She measured 80.9 cm in curved carapace (shell) length. She is taking part in the 2014 Tour de Turtles and was named by her sponsor, Sea Turtle Conservancy. CRUZ – Cruz is an adult female green sea turtle encountered nesting on July 6, 2013, on the beach in the Tortuguero National Park, Costa Rica. She measured 95.3 cm in straight carapace (shell) length. MORA – Mora is an adult female green sea turtle encountered nesting on July 5, 2013, on the beach in the Tortuguero National Park, Costa Rica. She measured 100.7 cm in straight carapace (shell) length. She was first encountered and flipper tagged by STC researchers in 2001 and was seen nesting again in 2004. SHELLDON – Shelldon is an adult female green sea turtle encountered nesting on July 13, 2012, on the beach in the Tortuguero National Park, Costa Rica. She measured 97.8 cm in curved carapace (shell) length). ADELE – Adele is an adult female green sea turtle encountered nesting on July 11, 2011, at Tortuguero beach. She measured 103.3 cm in curved carapace (shell) length. A satellite tag was applied after she finished nesting. ODESSA – Odessa is an adult female green sea turtle encountered nesting on July 10, 2011, at Tortuguero beach. She measured 106.5 cm in curved carapace (shell) length. A satellite tag was applied after she finished nesting. Her transmitter was sponsored by Shark Reef at Mandalay Bay. AURORA – Aurora is an adult female green sea turtle encountered nesting on July 21, 2009, at mile 2 6/8 of the Tortuguero beach. She measured 102.5 cm in curved carapace (shell) length. A satellite tag was applied after she finished nesting. Her transmitter was sponsored by Shark Reef at Mandalay Bay. CHICA – Chica is an adult female green sea turtle encountered nesting on July 20, 2009, at mile 2 4/8 of the Tortuguero beach. She measured 107.5 cm in curved carapace (shell) length. A satellite tag was applied after she finished nesting. She was named after one of STC’s longtime Board Members, Chica Maynard, who was the daughter of STC co-founder Joshua Powers. FREIJA – Freija is an adult female green sea turtle and was encountered nesting on September 10, 2001, at mile 2 3/8 of the Tortuguero beach. She measured 99.2 cm in curved carapace (shell) length and was first tagged (with tag #91477) by CCC researchers on August 31, 2001 while nesting at mile 2 3/8. A satellite tag was applied after she finished nesting. The name Freija was chosen by Volvo Ocean Adventure, the sponsor of Freija’s satellite transmitter. PEDDEL 02 – Peddel 02 is an adult female green sea turtle and was encountered nesting on September 11, 2001, at mile 2 of the Tortuguero beach. She measured 95.5 cm in curved carapace (shell) length and was first tagged (with tag #70386) by CCC researchers on August 25, 1997 while nesting at mile 2. A satellite tag was applied after she finished nesting. The name Peddel 02 was chosen by the Rotterdam Zoo, the sponsor of Peddel 02’s satellite transmitter. MANDALAY (aka Mandy) – Shark Reef is an adult female green sea turtle and was encountered nesting on September 12, 2001, at mile 2 4/8 of the Tortuguero beach. She measured 110.9 cm in curved carapace (shell) length and was first tagged (with tag #91686) by CCC researchers on September 12, 2001. A satellite tag was applied after she finished nesting. The name Mandalay (“Mandy” for short) was chosen by Shark Reef at Mandalay Bay, the sponsor of Mandalay’s satellite transmitter. CCC conducted the 2000 sea turtle migration study in partnership with Dr. Anne Meylan of the Florida Marine Research Institute, with technical assistance provided by NOAA/National Marine Fisheries Service researchers Barbara Schroeder and George Balazs, and the collaboration of the Ministry of Environment and Energy (MINAE), Costa Rica. Funding was provided by the U.S. NOAA/National Marine Fisheries Service. The hawksbill sea turtles were tracked as part of a research project being coordinated by the U.S. National Marine Fisheries Service (NMFS) that is tracking hawksbill migrations from nesting beaches throughout the wider Caribbean. Hawksbills nesting in Nicaragua, Belize, Mexico, Jamaica and elsewhere are also being tracked as part of the NMFS project. One map with the movements of all the 2000 Tortuguero turtles! ESPERANZA – Esperanza (Spanish for “hope”) is a green sea turtle and was encountered nesting on July 17, 2000, at mile 2 4/8 in the Tortuguero National Park . She measured 105.8 cm in curved carapace (shell) length and was first tagged by CCC researchers on July 14, 1996 during a false crawl at mile 4 4/8. A satellite tag was applied after she finished nesting. The name Esperanza was chosen from a list of suggestions submitted by dozens of school children in Tortuguero. Gloria Vianney Ruiz Atencio submittd the winning name. FREED – Freed is a green sea turtle and was encountered nesting on September 17, 2000, at mile 5/8 on the beach at Tortuguero. She measured 103.7 cm in curved carapace (shell) length and had not been previously encountered by CCC researchers. A satellite tag was applied after she finished nesting. The name Freed was chosen through a competition among Tortuguero High School Students. Arelys Calderon of the seventh grade submitted the winning name. MAMOI – Mamoi is a hawksbill sea turtle and was encountered nesting on July 19, 2000, at mile 5/8 on the beach at Tortuguero. She measured 85.0 cm in curved carapace (shell) length. She had two old tag marks on each flipper, indicating that she had been encountered during a previous season, but had since lost her tags. A satellite tag was applied after she finished nesting. Mamoi, which is short for “Me Amore” (my love) was named by CCC Research Assistants. 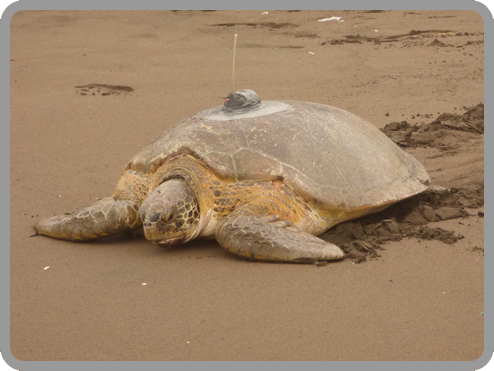 Mamoi was encountered by CCC Researchers on the nesting beach in Tortuguero, Costa Rica on July 2, 2003! MAREA – Marea (Spanish for “tide”) is a green sea turtle and was encountered nesting on September 18, 2000, at mile 2 5/8 in the Tortuguero National Park. She measured 99.3 cm in curved carapace (shell) length and was first encountered by CCC researchers in earlier this year. A satellite tag was applied after she finished nesting. Marea was named by the CCC Research Assistants. MARIPOSITA DEL MAR – Mariposita del mar (Spanish for “butterfly of the sea”) is a green sea turtle and was encountered nesting on September 16, 2000, at mile 2 5/8 in the Tortuguero National Park . She measured 108.1 cm in curved carapace (shell) length and was first tagged by CCC researchers in 1997. A satellite tag was applied after she finished nesting. The name Mariposita del mar was chosen from a list of suggestions submitted by dozens of school children in Tortuguero. Elder Espinosa of the third grade submitted the winning name. On the night of Saturday, August 24, 2002, two of CCC’s Research Assistants encountered “Mariposita del Mar” on the beach. She no longer carried the satellite transmitter that had been attached to her in 2000. MISS JUNIE – Miss Junie, named in honor of Miss Junie, is a green sea turtle and was encountered nesting on September 19, 2000, at mile 2 6/8 in the Tortuguero National Park . She measured 108.0 cm in curved carapace (shell) length and was first tagged by CCC researchers in 1997. A satellite tag was applied after she finished nesting. See story about Miss Junie. MISS TOMASA – Miss Tomasa is a hawksbill sea turtle and was encountered nesting on July 18, 2000, at mile 4 4/8 on the beach in Tortuguero National Park . She measured 86.5 cm in curved carapace (shell) length. She had old tag marks on each flipper, indicating that she had been encountered during a previous nesting season, but had since lost her tags. A satellite tag was applied after she finished nesting. Miss Tomasa was named in memory of of Miss Tomasa Gonzalez, matriarch of one of Tortuguero’s oldest families who recently passed away. ZENIT – Zenit (Spanish for “zenith”) is a green sea turtle that was encountered nesting on July 19, 2000, on the beach at Tortuguero. She measured 101.1 cm in curved carapace (shell) length and was first encountered by CCC researchers in June of this year. A satellite tag was applied after she finished nesting. The name Zenit was chosen through a competition among Tortuguero High School Students. Ines Rivas Castillo submitted the winning name.